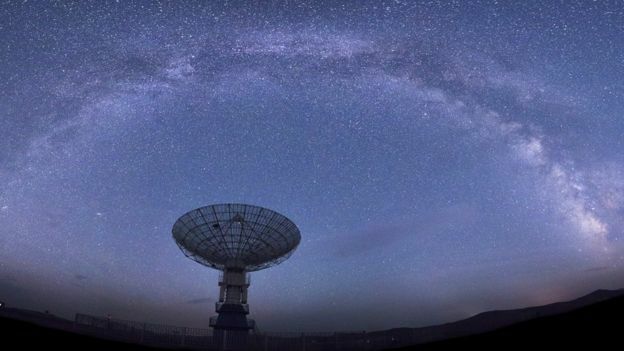 Mysterious signals have been picked up from distant galaxies. When fast radio bursts or FRBs, as they are called, reach Earth's telescopes they shine brightly for a few milliseconds, then disappear. Astronomers have detected dozens over the past decade - and have just announced they've found more of them, including a rare repeating signal. We don't know exactly what they are or where they're from, but here are several theories. A Rapidly Spinning Neutron Star: When stars explode and die they can end up as rapidly spinning neutron stars. Astronomers think those found in a region with a high magnetic field might produce the strange signals. 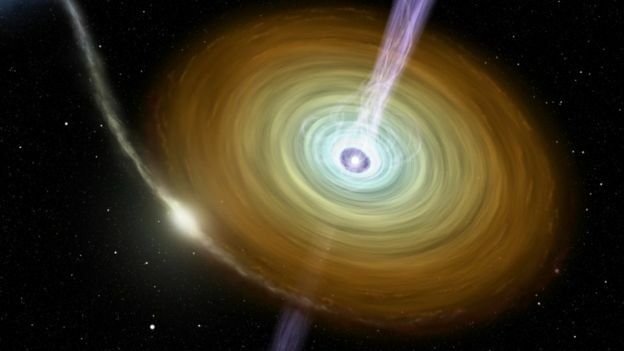 "Something like a neutron star fits the bill reasonably well actually," says Dr Ingrid Stairs, an astrophysicist from the University of British Columbia in Vancouver, Canada. "But exactly what physics is going into producing this very energetic burst of radio waves we don't really know yet." 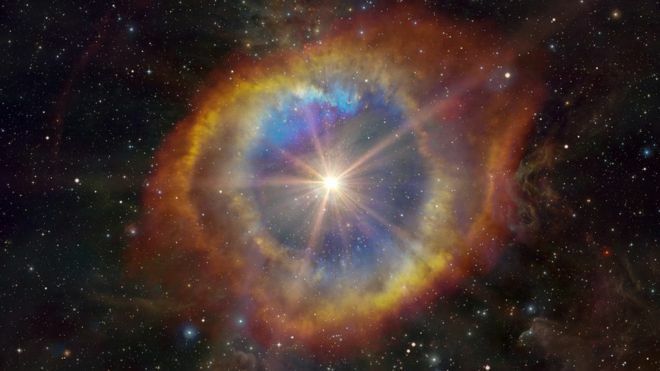 Two neutron stars colliding with each other is another possibility: According to Shriharsh Tendulkar, an astronomer at McGill University in Montreal, Canada, this is one of the main theories, but the scenario only works for cosmic signals that are only seen once, as the stars are destroyed in the process. "It's a cataclysmic event - it doesn't work for fast radio burst repeaters," he says. Most of the fast radio bursts picked up by telescopes in the last decade or so are seen once then disappear. Yet, two elusive signals have been found that burst into life again and again - and for these, there must be a different explanation. 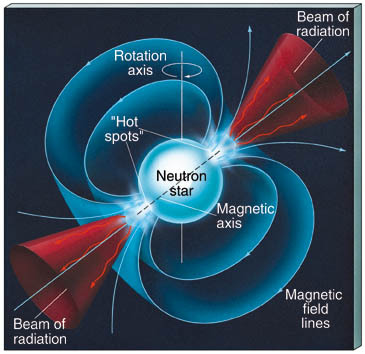 A blitzar: A Blitar is a rapidly spinning neutron star which collapses under its own weight and forms a black hole. Again, this ends in the destruction of the star, so could not produce a repeating signal. 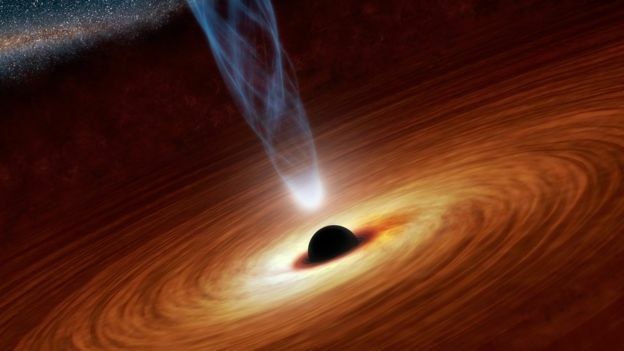 Black Hole: Black holes are implicated in many theories - from a neutron star falling into a black hole to a collapsing black hole or dark matter hitting one. Alien Life form: While some believe the signals are entirely natural in origin, others have speculated that they could be evidence of extra-terrestrial activity. Dr Stairs sees this as highly unlikely. "They come from all over the sky pretty much and many different distances - they must be associated with many different galaxies," she said. "It just seems completely inconceivable that there could be that many different alien civilizations all deciding to produce the same kind of signal in the same way - that just seems highly improbable."